Ok, now it’s time to get ready to sell your home. Where to start? Well, one great way that will most likely make you more money is to stage your home. 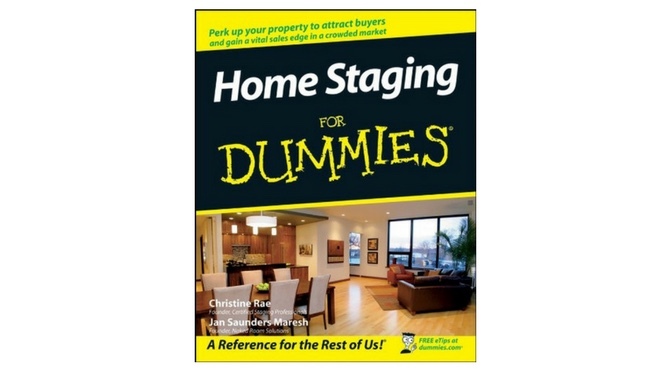 Home Staging for Dummies is a book that can help the novice, or the professional. Heck, I even share my copy, or buy a copy for my own clients when listing their homes for sale. This book is super easy to read, offers before and after photos, and is very handy to use. At a cost that won’t break the bank, it will allow you to gain the knowledge to stage your home, de-clutter it, and have it ready to sell. You will learn how to see your home the way that buyers will see it. You will know what needs to be done, and what doesn’t. The book shares insights in how to determine when you can do it yourself, or when its best to call a professional. Rooms that are covered are the kitchen, bathroom, living rooms, dining rooms, and of course family, and bedrooms. How to make sure your mechanical are in shape, and how to avoid expensive staging nightmares. For those needing a little help on the outside of the home, there are even tips on how to make sure your porches, patios, and decks look awesome. Allowing them to shine, and say “welcome home” to a buyer. This is a great book for someone looking to sell their home themselves. It is super easy to understand, and very inexpensive to buy. If you are a real estate professional, a great tip is to buy a couple of copies to share, or give to your sellers when listing their homes. This will allow you the extra touch that will gain trust from them as their Realtor, and make your service unique. It will also allow you a frictionless way to help your clients make sure their home looks it best. All without you having to have the guide them, or worse, have confrontations with them about messy rooms, or aging finishes. To learn more about the book, read reviews, or buy you or a client a copy, you can click here. Have questions on how I use it in my own business, use the space below to post a comment. I will reply as soon as possible.